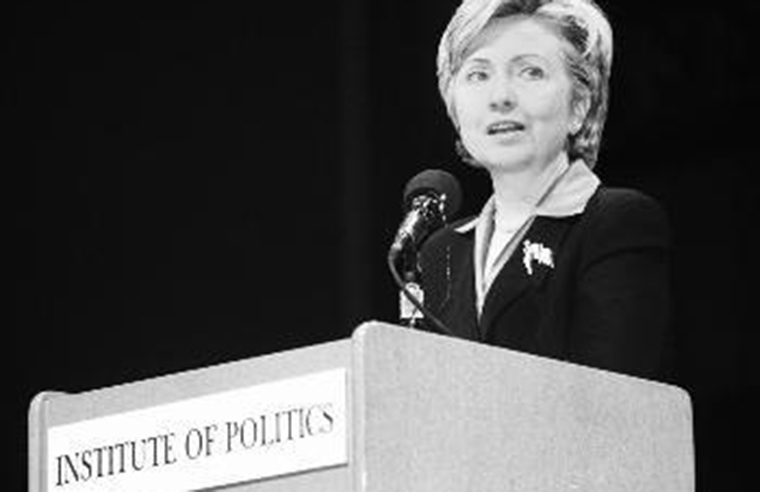 Former Secretary of State Hillary Clinton speaks at Sanders Theatre on March 11, 2002. The then-senator discussed tax policy and public service six months after the Sept. 11, 2001 attacks. Former Secretary of State Hillary Clinton could be the next political magnate to join the Harvard Kennedy School's roster of experienced politicians and policymakers. "We have extended an invitation to Secretary Clinton to consider engaging with the university and would of course welcome her interest in a range of roles," Kennedy School spokesperson Doug Gavel wrote in an email to The Crimson on Thursday. Politico reported Wednesday that both the Kennedy School and Yale University—where Clinton received her law degree—have offered the former secretary of state a position from which she could launch a presidential campaign for 2016, as many speculate she might. New York University and Baruch College, both institutions closer to Clinton's home in Chappaqua, N.Y., have also reached out to Clinton, according to Politico. “A number of academic institutions have reached out with ideas. We’re following up with each to discuss them,” said Clinton spokesperson Nick Merrill, according to Politico. Politico reported that Clinton adviser Maggie Williams is handling those discussions, which are in the "listening" stages. Gavel gave no indication of whether Clinton would come as a faculty member or in another capacity, should she come to Cambridge. Other possibilities include appointment to a fellowship such as the Angelopoulos Fellowship for high profile leaders transitioning out of public office. Former President Bill Clinton helped announce the creation of the fellowship in 2011. Former President of Mexico Felipe Calderón, the program's first Fellow, will leave the post in December, leaving a possible vacancy for the former secretary. According to a poll conducted on Aug. 1-2 by Rasmussen Reports, 63 percent of likely Democratic voters would vote for Clinton for president were the primary held at the time of the polling. Vice President Joe Biden trailed with only 12 percent of current support and the rest of potential candidates received support in the single digits. Clinton has been a presence at Harvard in the past. In 2002, then Senator Clinton appeared at Harvard's Sanders Theatre to deliver a speech discussing the war in Afghanistan and criticizing the Bush tax cuts. Clinton spokespeople did not respond to a request for comment for this article. —Staff writer Steven R. Watros can be reached at watros@college.harvard.edu. Follow him on Twitter @SteveWatros. President Barack Obama is considering nominating University Professor Lawrence H. Summers to head the World Bank, according to a Bloomberg report published Wednesday. The show succeeded through not only its expert musicianship and production design but also its faithfulness to the sound and energy of Clinton's genre-defining work. Clinton’s approach is exemplary of the kind of honesty that our discourse needs. This is not the phony moderation adopted by so many pundits who crave a veneer of credibility at the expense of factual accuracy, but rather a robust, honest, and, yes, political defense of his party’s vision for America.